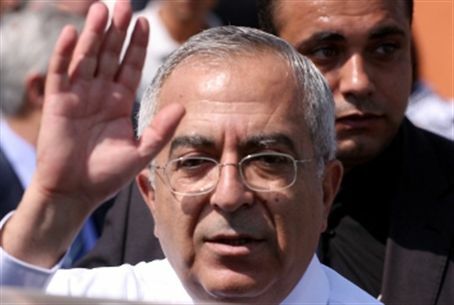 Palestinian Authority prime minister Salam Fayyad says PA's dependency on charity is not a valid argument against assuming mantle of statehood. Palestinian Authority Prime Minister Salam Fayyad said Wednesday that the PA's inability to pay its bills and its regular pleas for charitable cash infusions from the international community was not an acceptable argument against PA statehood. “The crisis does not undermine or cast doubt about our preparedness for the establishment of the state,” Fayyad insisted during his weekly radio address on Voice of Palestine radio. "All states face financial troubles and need the correct procedures and oversight to overcome such problems." “Civil servants will receive today half of their monthly salaries, and the other half will be paid when cash is available,” he added. The decision to pay half salaries is a result of the PA's latest crippling financial crisis, which has lasted for almost a year. “So far, we have received only $331 million out of $970 million [in international donations] we were supposed to receive to cover the budget deficit of this year. Since we could not borrow more from the banks, we were forced to pay half salaries,” he added. Fayyad claimed that the PA has always been able to meet its debt requirements, even when the deficit has reached more than 1 billion USD, but failed to mention that the PA's shortfalls are often covered by Arab states who step in to bail it out. He voiced hope that Arab countries would still step in and help the PA overcome the crisis – saving it yet another time. PLO Secretary-General Yasser Abed Rabbo told Voice of Palestine that the PA was surprised by the Arab countries’ “failure” to assist it and accused them reneging on their promises. Abed Rabbo said that the crisis would not prevent the PA from proceeding with its plan to ask the United Nations in September to recognize a PA state along 1949 Armistice lines. "We can't rely on negotiations to end the occupation because Israel does not want negotiations.” Abed Rabbo said. But the Arab world's reaction to the PA statehood bid at the United Nations has been tinged with quiet skepticism and Western donors – whom Fayyad asked for $5 billion to launch a state – have largely rejected his request for funds and reacted negatively to the attempt at unilateralism. Jordan has openly said it will vote against PA statehood at the United Nations in September.